If you are having a party – you are in charge of helping people feeling great throughout the night. Create trail mixes using air-popped pop corn, look up recipes online to bake with stevia, honey and coconut sugar instead of white sugar, and coconut or almond flour instead of regular white flour, try creating grilled veggie monster platters, using beets and tomatoes to make blood-like looking sauces and dips. How to handle all the leftover holiday candy? 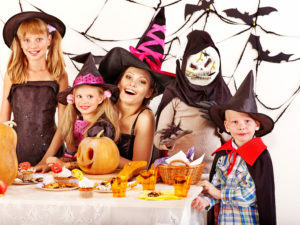 After Halloween is over, let your child pick one treat to eat each day for 1 week, donate the rest. Googly eyes, lip balm, pom poms, erasers – think arts and crafts. You can pick up items in your local dollar store, or even get a wholesale rices on the internet. If you are struggling with sugar cravings, pick up the copy of “Cravings Boss – the real reason you crave food and a 5-step plan to take back control.” Available on Amazon. Wishing you all a fun Halloween!